This is a sponsored conversation written by me on behalf of Bob’s Red Mill. As always, all opinions are my own and I only work with brands that I use, love and recommend. Please see the disclaimer here. With the holiday season fast approaching, one thing I really want to focus on with my girls is how important the giving aspect of holidays is (specifically with A because T is still too little to understand). It can be so easy to get caught up in the stress of the holidays and gifts that we want for ourselves, but giving is such an important part of life in general and this is especially true around the holidays. As you guys probably know, one of my favorite ways to show my love is through food. Taking the time to cook or bake something delicious from scratch with the sole purpose of brightening another person’s day. Letting them know your love them and are thinking of them. It’s the little things. And plus also, nothing says love like freshly baked cookies! So when the opportunity presented itself to team up with Bob’s Red Mill again (you can see our last collaboration here) to share some love through baked goods, I jumped at the chance. 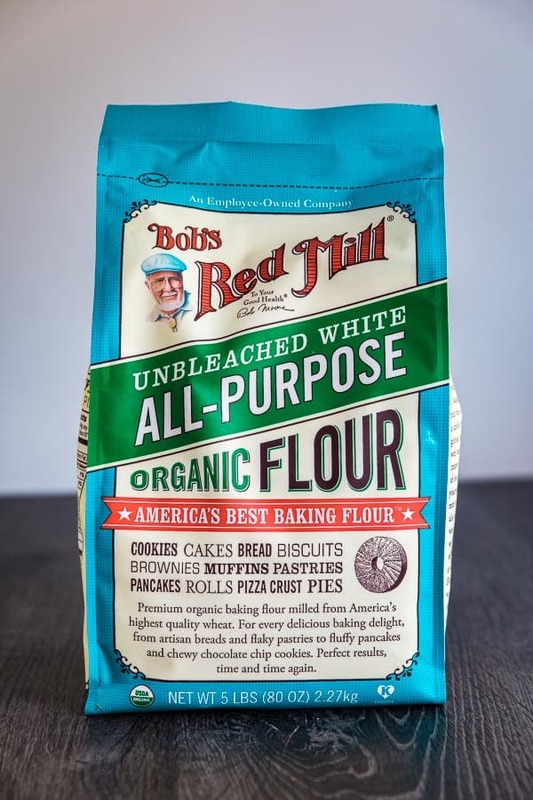 I’ve been a huge fan of Bob’s Red Mill products for a long time because they are the highest quality and they really take my baked good from tasty to excellent. But I am especially loyal to these products because they also believe in making the world a better place through small acts of kindness. And that is something we could all use more of in this world. So these cookies are Made with Love, Baked with Bob’s. For this collaboration, I wanted to take a traditional cookie that we all know and love and add a seasonal twist to make it even more unique and delicious. I settled on apple cinnamon as my flavor profile for a few reasons. First of all, who doesn’t love apples? Nothing says comfort and holidays like an apple-themed dessert. I also love the idea of taking the same flavors as an all-American apple pie and integrating them into a cookie. 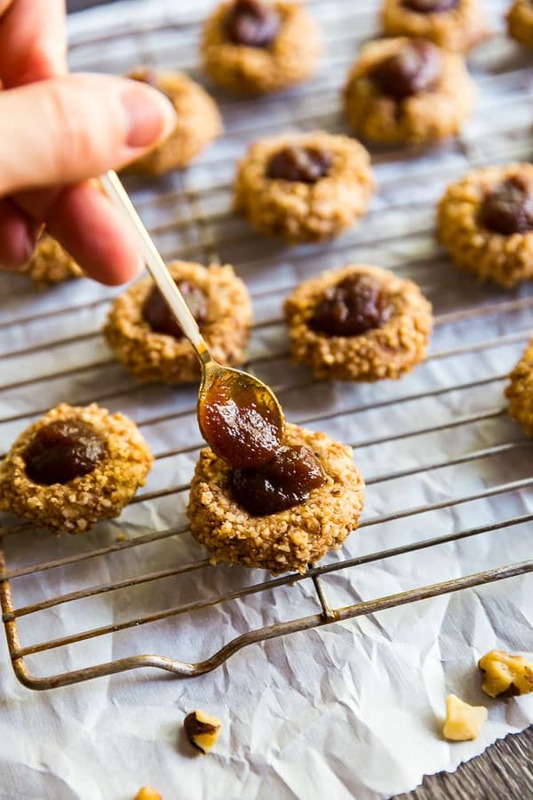 These Apple Cinnamon Thumbprint Cookies are full of great, seasonal flavor. They’re also super easy to make. For the filling, I used store-bought apple butter, but if you want to make your own apples butter, but you can find some great ones here, here and here. I also shared a variation of this recipe in the recipe notes if you’re baking for a friend or family member who cannot eat nuts. I try to take this into account with much of my baking because we have a few family members who cannot eat nuts and I want them to enjoy as many of my holiday confections as possible! I shared these Apple Cinnamon Thumbprint Cookies with one of our neighbors. We are super lucky in that we have several neighbors who are so friendly and kind. The neighbor we brought these to has been especially generous in allowing us to borrow a few tools that we don’t own. He loved these cookies as much as well did! 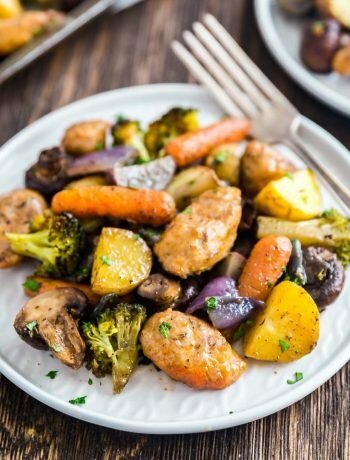 Preheat the oven to 350 degrees and line a baking sheet with a Silpat or parchment paper. Mix butter, sugar egg yolk and vanilla until well combined. Stir into flour, salt, 1/2 teaspoon cinnamon and nutmeg until just combined. In a small bowl, combine chopped nuts and remaining cinnamon. Roll each ball in egg white and then the nuts mixture. Place each ball onto the baking sheet around an inch apart. Using your thumb or the back of a spoon, create a small hole in the middle of each cookie being careful not to go all the way through (the "thumbprint"). Fill the thumbprints with apple butter. Variation: if you don't want to use the nuts/cinnamon mixture you could substitute it by rolling the balls in a mixture of 2 Tablespoons of sugar + 1 teaspoon cinnamon. November 12, 2017 at 8:33 pm I love the combination of apple and cinnamon! You are right it’s the perfect time to break out this recipe. I will have to try these on my family. November 12, 2017 at 10:48 pm Thanks Leslie- I agree- it's a time-honored classic flavor combo. Enjoy!